Your generosity helps Easterseals provide help, hope and answers to people living with autism and other disabilities and the families who love them. Donate Now — Make a secure online gift. Make a Tribute or Memorial Gift — Donate in memory or in honor of someone special. We will mail an acknowledgment card, or click here to make a gift and send one of our eCards right now. Create a Personalized Web Page — Raise funds in honor or memory of friends and relatives, to celebrate birthdays or weddings or simply to tell your own story about Easterseals. Donate to a Friend’s Personal Fund Raising Web Page — Find a friend's or family member's personal fund raising page and donate online to support them. Set Up a Matching Gift — Many employers sponsor matching gift programs and will match any charitable contributions or volunteer hours made by their employees. Find out if your company has a matching gift policy. Transfer Securities to Easterseals (PDF*) — Have you ever considered donating your securities (i.e. stocks and mutual funds) to Easterseals? There might be additional tax advantages associated with donating securities instead of cash. Download our instructions. Workplace and Employee Giving — Workplace giving programs provide an easy way to join the movement to support people with disabilities and their families at Easterseals. Simply sign up for your employer’s workplace giving campaign and use automatic payroll deduction to make your donation to Easterseals. Gift Planning — Meet your financial, tax, or estate planning objectives while providing critical support to children and adults with disabilities. Register for an Easterseals Walk With Me Event Near You — Raise funds as an individual or as part of a team. Sponsor a Walk With Me Participant — Support friends participating in an Easterseals Walk With Me event. Join the President's Council — Make a vital difference in the lives of people living with disabilities with a donation of $1,000 or more. Easterseals primary services benefit over 1.3 million individuals each year through more than 550 centers nationwide, in Puerto Rico and Australia. For children and adults with disabilities and their families, every donation counts. Find out how your contribution makes a difference — review our annual report and financial statements. 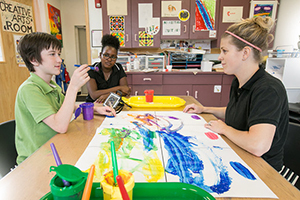 For 25 years, Easterseals has been first among National Health Council members for the percentage (94 percent) of program dollars allocated to providing direct services. For donors, Easterseals’ efficient use of their contributions also is an important factor when making the decision to support its innovative services and programs.